Do you like prints? Especially special, limited edition signed and numbered prints? You do?? Then do I have a surprise for you! There are 25 prints each of Nest, For Science, and Healthy Relationships and they are all looking for good homes! Each print is $30, which includes shipping (shipping takes between 2 – 6 weeks depending on your location). EDIT: Yes! These ship internationally! The mail service I use provides tracking information for US orders only, but ships worldwide. These prints have been lovingly redrawn and, this year, locally printed, and they look so wonderful. 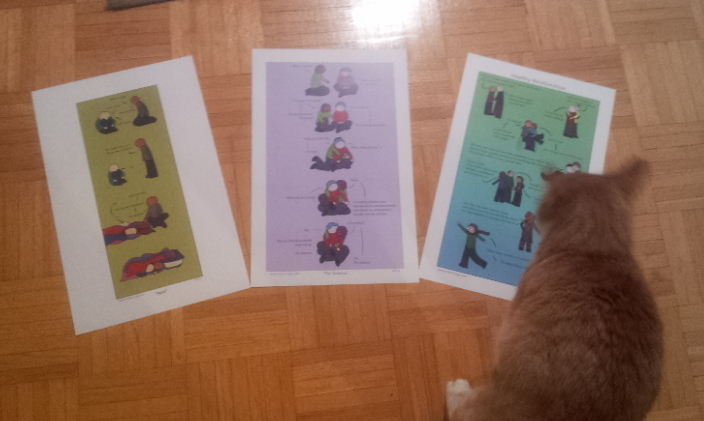 Above is a fuzzy picture of Oskar inspecting them for flaws and he says they’re great! To buy a print (or two!) please visit prints.robot-hugs.com. Get them while you still can!